Panoramic view of Yuraku-cho in Chiyoda-ku, Tokyo. 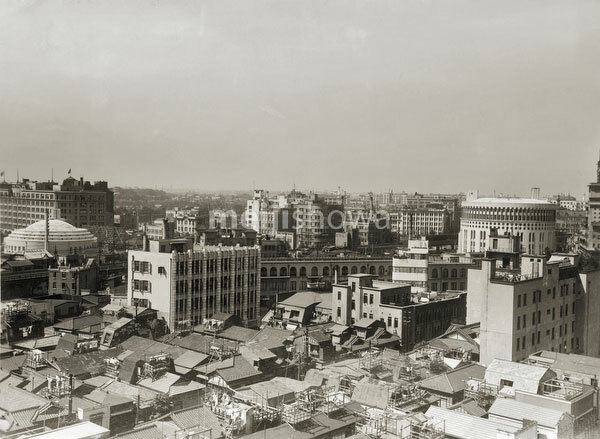 The large circular building on the right is the Nihon Gekijo (日本劇場), popularly known as Nichigeki (日劇), designed by Japanese architect Jin Watanabe (渡辺仁, 1887-1973). The theater opened on Dec 24, 1933 (Showa 8) and closed its doors on Feb 15, 1981 (Showa 56). Managed by Toho Co., Ltd., it featured several theaters for musicals, plays, dance shows and movies.